This edition of our newsletter will focus on the development of Genealogy Quebec, the Drouin Institute’s primary genealogical research website. Close to 330 000 baptism and burial records from the 1850-1861 period have been added to the LAFRANCE in the past few months. We estimate that this represents about a third of all records for this period. The additions are made through our bimonthly update and will continue until the period is concluded. The LAFRANCE is an index with link to the original document of ALL catholic marriages celebrated in Quebec between 1621 and 1915, ALL catholic baptisms and burials celebrated in Quebec between 1621 and 1849, and ALL protestant marriages celebrated in Quebec between 1760 and 1849. The LAFRANCE is one of the multiple tools available to Genealogy Quebec subscribers. 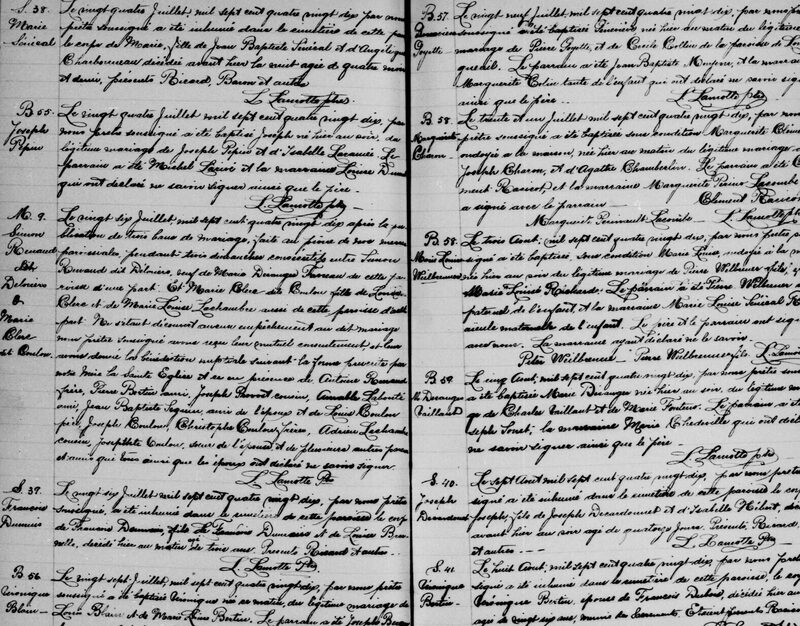 Last spring, a database of Acadian records and families was added to Genealogy Quebec. This database covers over 40 000 families, and provides a link to the original document from which the data is sourced. This tool is available to Genealogy Quebec subscribers and can be accessed from the tool list. A reminder that the 33% sale on our online shop is still active. For more details, read our October 20th newsletter. You may have noticed a logo change on the English version of Genealogy Quebec. When the site was first translated years ago, Quebec Records was chosen as the official name. Over the years, we realized that having a different name for the French and English versions created confusion among our users. Thus, Quebec Records has been rebranded in Genealogy Quebec. The content of the website remains unchanged. Also note that you can now use the http://genealogyquebec.com URL to be redirected to the english version of the website directly.